I have been meaning to blog this for a while but I've struggled to get a decent photograph of it. It is one of my sister's most-requested things that I can make for her (alongside the world's most garlic-y pasta). The time-consuming part is the sauce as it is cooked really slowly. The fish itself only takes 10 minutes in the oven. I recently learned how to skin fish too, which has made all the difference to the end result as no longer do you have to unravel the fish as you eat it to remove the skin. Skinning fish is surprisingly easy, so long as you have a decent sharp knife and a steady hand. Although the sauce takes the longest with this recipe, I tend to start with the fish so it's done and out the way. To skin the fish, place it skin-side down on the cutting board. With the knife held at a slight angle (I use quite a big, heavy one as it gives the most control), hold the tail end tight and begin approximately one quarter of an inch from the end. Using a gentle sawing motion, cut the flesh from the skin. Fold the fish so that the top and tail ends are underneath, then place two folded fillets together on a sheet of foil at least 25cm by 30cm. Place a small shaving of butter on top of each fillet, season with a grind of pepper, pour a tablespoon of white wine over each pair of fillets then place a sprig of rosemary on top of each. Fold up the foil so the fish parcels are sealed in. Repeat for the remaining six fillets then set aside until ready to bake. To make the sauce, finely chop a shallot, quarter each of the tomatoes lengthways and peel two cloves of garlic for crushing. Heat the olive oil in a saucepan and slowly cook the shallots until soft. Then add all the tomatoes and lemon juice then crush in the garlic. Turn the heat down as low as it will go and cook the tomatoes until they begin to lose their shape. Try to stir the sauce as little as possible. Pour in the remainder of the wine (you should have approximately a wine glass-ful left) and gently stir the tomatoes to make sure nothing is sticking, then simmer the liquid right down to a thick sauce. Season with salt and pepper to taste. If still a little sharp, add in half a teaspoon of granulated sugar. 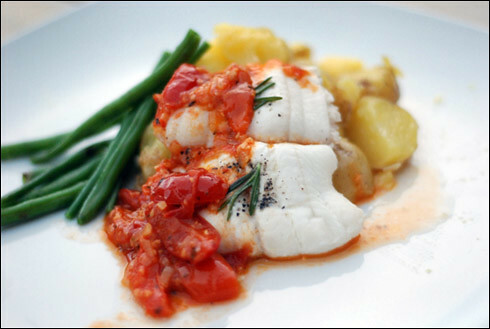 While the sauce is reducing, put the oven on at 180°C and once up to temperature, bake the fish for 10-15 minutes. Once cooked, remove from the foil, arrange on plates and spoon a couple of dessertspoons of the tomato sauce over each plate. I served this with fresh french beans and partially sautéed new potatoes.